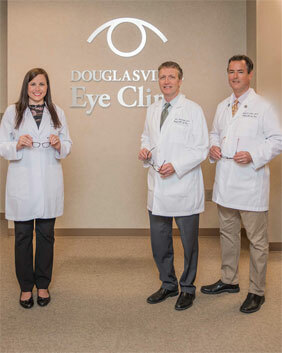 Douglasville Eye Clinic was founded by our two ophthalmologists (Eye MDs), David S. Hemmings, MD and Stephen D. Tedder, MD. Both Dr. Hemmings and Dr. Tedder are from the Southeast and have been practicing in the Douglasville area since 2000. They have over 30 years of combined experience in the practice of ophthalmology. In September 2017 Shae W. Steward joined the practice. Dr. Steward is a comprehensive ophthalmologist and can take care of all your eye care needs. Our Douglasville Eye Clinic physicians and compassionate, experienced staff take pride in delivering state of the art medical and surgical ophthalmology services in the most ethical fashion. Dr. Hemmings received his undergraduate and medical degree from the University of Kentucky and his ophthalmology training from the University of Michigan. Dr. Tedder received his undergraduate and medical degree from Duke University and his ophthalmology training from the University of Texas Southwestern. Dr. Steward Dr. Steward received her undergraduate from Auburn University and medical degree from the University of South Alabama and her ophthalmology training from the University of Arkansas, Medical Sciences.